Over the past 10 years, Sabre has introduced a line of medium-displacement performance-oriented cruising boats ranging in size from 36 to 45 feet, all designed by Jim Taylor, that have been exceptionally well executed. We were not at all surprised, therefore, to find that Sabre and Taylor have again done a superb job of balancing performance, liveaboard comfort, and quality construction in a single package. The interior layout is straightforward and clean, finished in matte-varnish cherry, with excellent joinery work and details, such as dovetailed maple drawers. There is copious stowage--more than enough to satisfy owners with long-distance cruising ambitions--primarily because Sabre has resisted the common temptation to cram in an extra head. The electrical and mechanical systems we rated as first class, with one lonely criticism of engine access, which was deemed a bit tight, particularly for changing the engine oil. We found the boat a joy to sail. The wing-keel shoal-draft version we tested was reasonably close-winded, powered up quickly, and tracked very well in light-to-moderate wind on Narragansett Bay. We were also impressed with the 426&apos;s understated good looks and the subtle blending of modern lines with traditional details. The boat&apos;s construction and rigging reflect the same sense of balance and good taste. 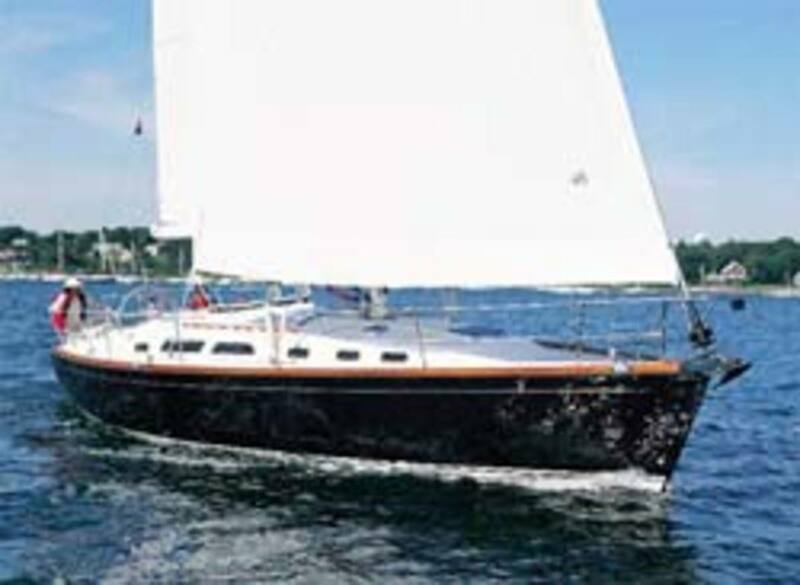 Modern elements, such as a vacuum-bagged hull with a Divinycell core, a carbon-fiber rudderpost, and rod rigging are thoughtfully mixed with traditional "commonsense" points like a through-bolted deck joint, a high-quality Hall Spars aluminum mast, classic topsides aesthetics, and no-nonsense Maine workmanship. Though the 426 is by no means an inexpensive boat, we think it is good value and compares favorably with boats costing much more. Price: $310,000 (FOB South Casco, ME), excluding sails and electronics. Construction: Hull and deck are E-glass over a Divinycell core, with high-density PVC core in all hardware locations. The hull is vacuum-bagged. The rudderpost is carbon fiber.